Cycling should be accessible for all! Bike designers are looking into ways to best meet the needs of every kind of cyclist. Derek Rayside, an all season rider and activist based in Toronto with a penchant for tandems, points out the best rides for every kind of bike fan in your life. 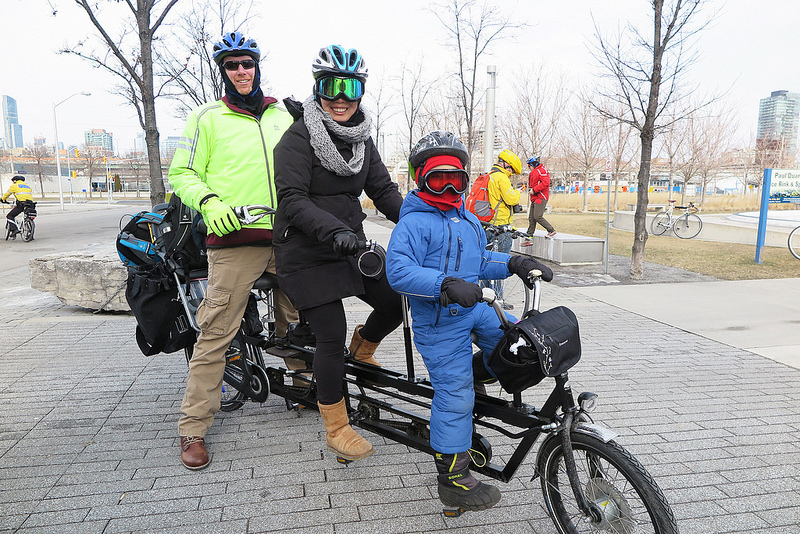 The author and his family at the Coldest Day of the Year Ride on a Onderwater family tandem. Photo by Yvonne Bambrick. Tandem, or multi-rider, bikes can make cycling accessible to many people who might not otherwise be able to enjoy cycling. Whatever the challenge, from a wheelchair to blindness, from infirmity to inexperience, there is a great bicycle available for you to share with a friend. On a tandem bicycle, the captain is the person who steers, shifts, and brakes (and usually provides most of the power); the stoker provides auxiliary power. 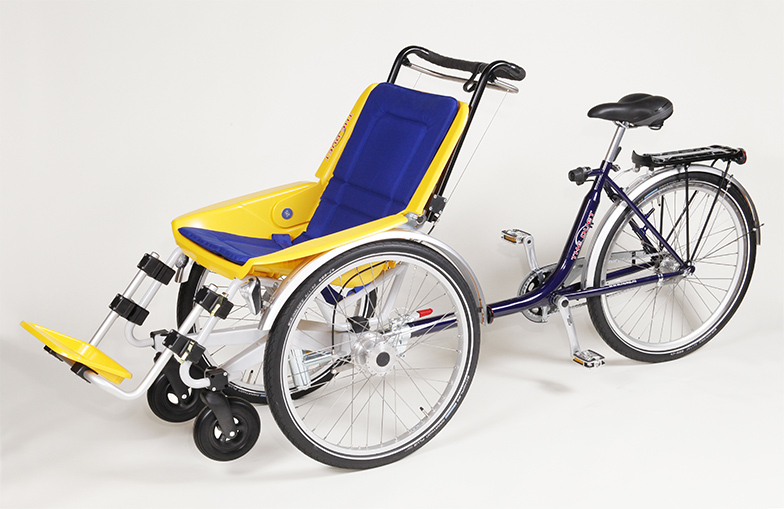 There are some great new tandem tricycles that connect with wheelchairs. 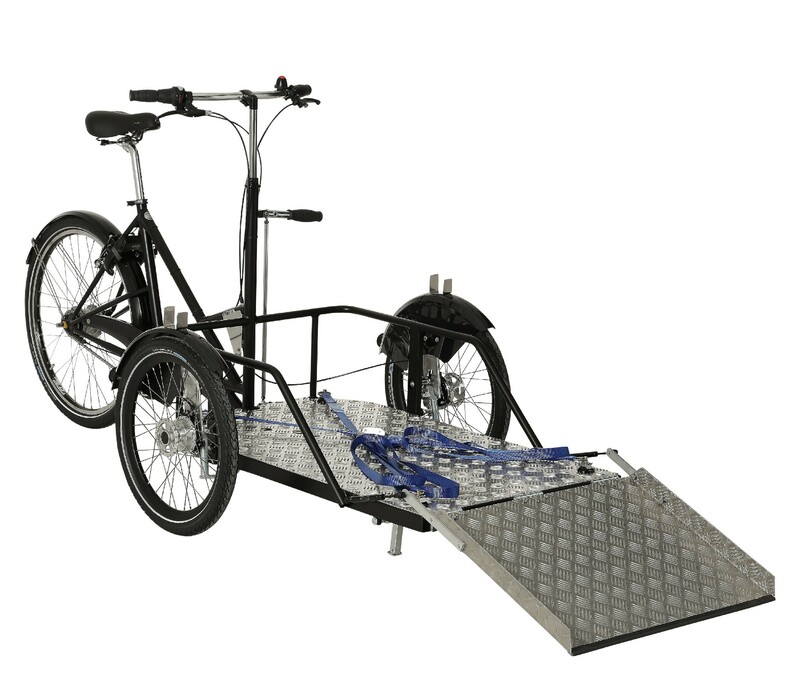 The Duet Cycle, made in Holland and available in Canada from the Flaghouse, has a fully functioning detachable wheelchair at the front. 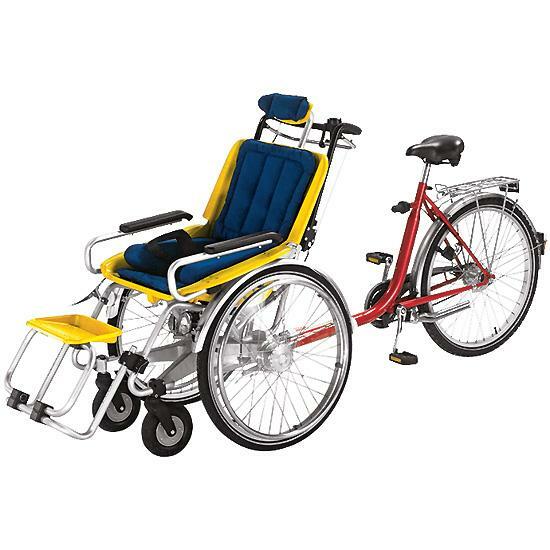 Pedal your friend to your destination, then detach the wheelchair and push them inside. Nihola, from Denmark, makes a cargo tricycle with a platform, also at the front, intended to carry a wheelchair you already own --- with the passenger in it, of course! Nihola is available at Curbside Cycle on Bloor St, Urkai in Burlington, and Alo Velo in Montreal. 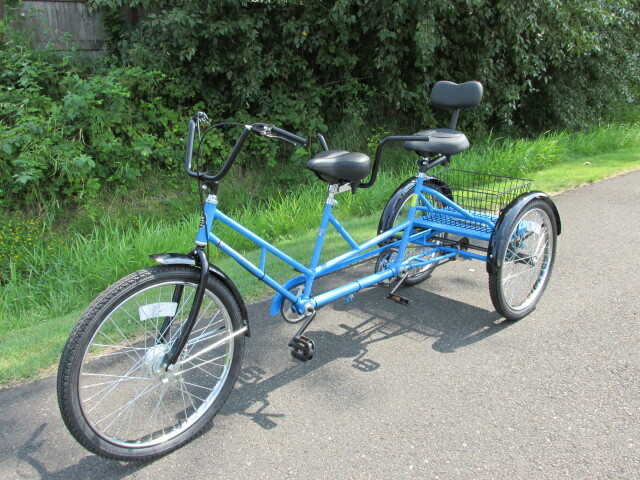 There are also a variety of tandem tricycles that do not involve wheelchairs. 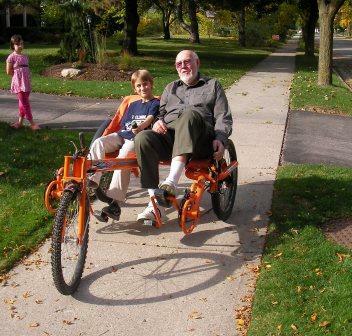 Rick Hendrikx and his family in Kerwood ON make a recumbent tandem trike with the captain and stoker sitting side-by-side. 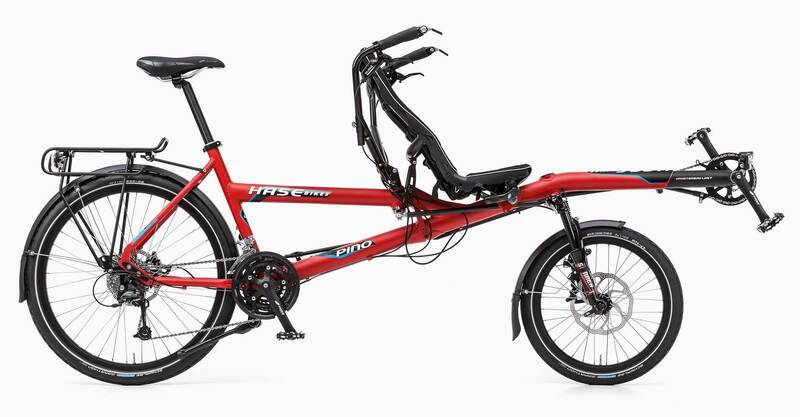 If you are comfortable balancing for another person (who should be lighter than you), then both conventional and innovative two-wheel tandems are available. Many bike shops carry conventional tandem bicycles, with the captain in front, and both riders having conventional saddles. Two innovative tandems that are available in the Toronto area are the Hase Pinot and the Onderwater Family Tandem. Both of these put the stoker(s) up front for a better view. On the Hase Pinot (available at Urbane Cyclist on College St), the stoker has a recumbent seat, and so requires less core strength to stay on the bike. The Onderwater Family Tandem (available at Urkai.com in Burlington) is intended for an adult captain in the rear, with a child stoker up front. My family has the XL version, with two stokers up front. One of the factors that motivated us to get this bike was that my spouse did not have the opportunity to learn to ride as a child. With our tandem, I could balance for her as she learned. Now she leans into turns with the best of them. Similarly, our son learned to ride on our family tandem, as will his younger sister. This bike is our main mode of family transportation around town, for groceries, hockey, kung fu, etc. : whatever we need to get to, we ride all together on our family bike. These innovative tandems can make cycling accessible to people with a variety of sizes and abilities. At the Terry Fox Run last falI gave a ride to a boy with muscular dystrophy who had never been on a bike before. He loved it! He had enough strength to keep himself in the saddle, but not to pedal and not to balance the bike: he didn’t need to do those things on the tandem; he could just enjoy the wind in his hair. Our family tandem is large enough that his older sister and my two children also came along for the ride --- with the rider of honour up front. 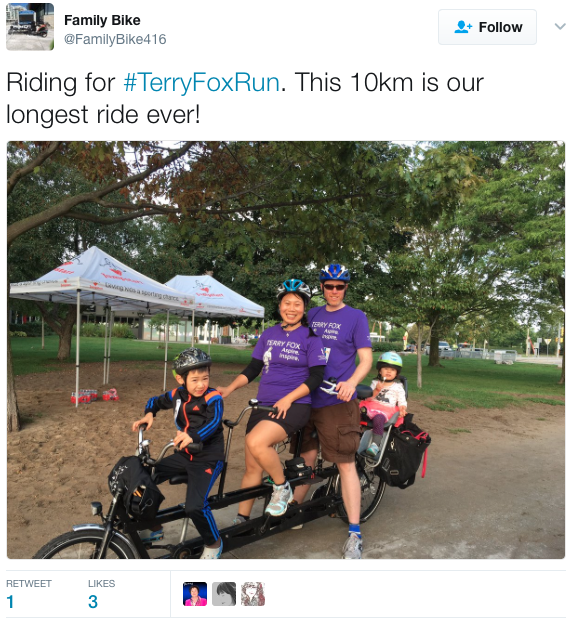 As for the Terry Fox Run, his amazing sister ran the entire distance pushing him in his wheelchair while their grandmother cheered them on. There are two non-profits in Toronto that connect volunteer captains with stokers who need assistance. The Toronto TrailBlazers Club provides loaner bikes for rides with vision-impaired stokers --- and has been doing so for almost 30 years. Cycling Without Age is a newer non-profit, based in Denmark, with ten Canadian chapters, including Toronto. Their trikes have a bench for two adult passengers up front, and their motto is “the right to wind in your hair”. There are lots of ways to get involved. You can make arrangements for Cycling Without Age to visit your grandparents retirement home and take them and their friends for a ride. Or you can volunteer to be a captain with either organization and meet some great new people. Or you can make a donation towards either worthy cause via their web pages. Whatever your situation, there is a bike that you and your friend can enjoy together. Ride on!